In preparation for a joint seminar I’ll be doing with Midori Harris here at the EBI, here’s a classic paper [1,2] on the social problems of building biomedical ontologies. This paper is worth reading (or re-reading) because it makes lots of relevant points about the use and abuse of research and how people misunderstand each other . It’s funny (and available Open Access too) plus how many papers do you read with an abstract written in the style of Big Bard Bill Shakespeare? ABSTRACT: Two households, both alike in dignity, In fair Genomics, where we lay our scene, (One, comforted by its logic’s rigour, Claims ontology for the realm of pure, The other, with blessed scientist’s vigour, Acts hastily on models that endure), From ancient grudge break to new mutiny, When ‘being’ drives a fly-man to blaspheme. From forth the fatal loins of these two foes, Researchers to unlock the book of life; Whole misadventured piteous overthrows, Can with their work bury their clans’ strife. The fruitful passage of their GO-mark’d love, And the continuance of their studies sage, Which, united, yield ontologies undreamed-of, Is now the hour’s traffic of our stage; The which if you with patient ears attend, What here shall miss, our toil shall strive to mend. 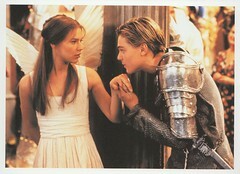 So if you read the paper, you have to ask yourself, are you a Montague or a Capulet?